The push pins are made up of 1/2-Inch heads mounted over 3/8-inch ground steel points. We avail you with these versatile and handy office essentials at amazingly low costs. These come packed within a clear plastic case, with a quantity of 100 pins per box or 200 per tub pack. These push pins are reusable for as many times as you wish. These are well-packaged to enable a handy and safe usage for your desk top or drawers. You can buy these in multiple colours or clear colour as per your needs and preferences. We ensure that the pins we offer have smooth and well-extended heads to allow for an easy use. The steel points are sharp making these pins, perfect for use over the marking maps, bulletin boards, hanging posters and so on. 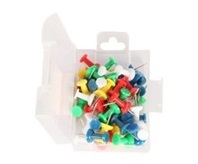 Order online to enjoy the most sought after push pins of high quality and assorted colours at affordable prices.